An unusually public discussion about supporting local low-cost carriers is occurring in Taiwan. Once a sleepy market, like elsewhere in North Asia, Taiwan is seeing growth on the back of regional services and cross-strait flights to mainland China. But a shakeup is needed if Taiwan is to realise its goal of increasing tourists from six million in 2011 to 10 million in 2015. New and high-profile LCCs are entering, including Scoot, a subsidiary from none other than perceived industry-standard Singapore Airlines, as well as Peach Aviation, partially backed by All Nippon Airways in Japan, a market once synonymous with stagnation. With LCCs from the north and south, as well as Jetstar setting up a subsidiary in Hong Kong, Taiwan is understandably seeing opportunity. But there is also the threat of encirclement, although not all incumbent Taiwanese carriers agree on that. China Airlines and EVA are cautious to unsupportive while the LCC mongering has been pushed by TransAsia Airways, whose lean position could see it capitalise on opportunities. Taiwan's regulator has finally entered the discussion and effectively gave its blessing for local LCCs to be established, although significant reforms are needed. If realised, great benefits await. 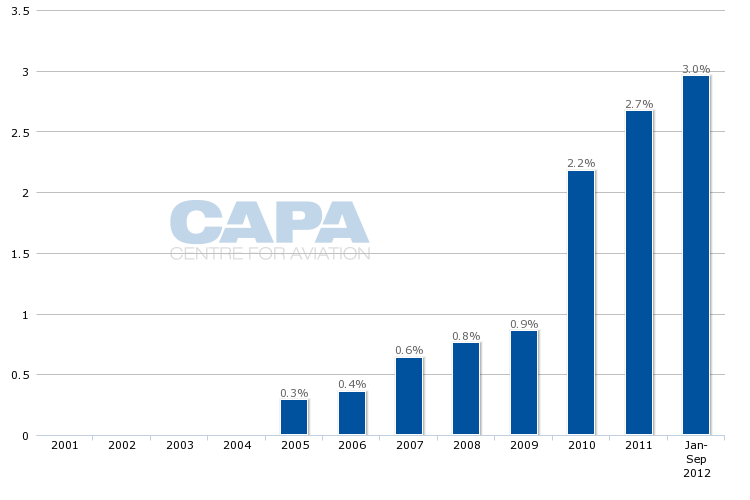 LCCs in the nine months to Sep-2012 will comprise 3% of international Taiwanese capacity, according to OAG. This is a marginal increase from 2011's figure, although the full-year figure will rise once new services are accounted for – Scoot in Sep-2012 to Singapore and later to Tokyo Narita, and two Peach services by end-2012. 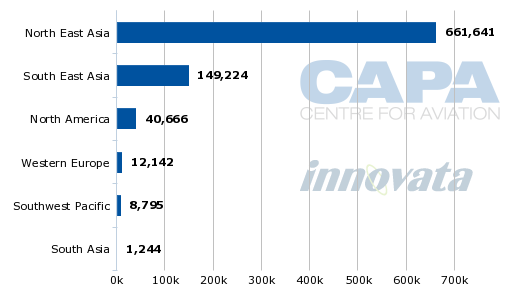 These figures belie the volume growth LCCs have achieved as legacy carriers have also grown, limiting marketshare growth. The largest LCC marketshare change occurred between 2009 and 2010, when new services from carriers including AirAsia and Jetstar helped increase LCC capacity. Taiwan's LCC penetration rate is far below the 24% share of seats LCCs represent for travel within Asia-Pacific. Specific markets see even higher marketshare rates, with LCCs now accounting for about 47% of international seats in Malaysia. South Korea, which has four internationally-flying hybrid LCCs, has an LCC penetration rate of about 8% in the international market. Japan is closer to Taiwan with about a 4% rate, but this will rise significantly within the next year as its new LCCs ramp up international services. Taiwan has little domestic market to speak of due to the country's small size and competition from high-speed rail which, unlike in Japan, is affordable and becomes a LCC challenger. About 94% of Taiwanese capacity (seats) is currently allocated to the international market and the majority of that – 76% – is within North Asia. An additional 17% of international capacity is to Southeast Asia, meaning 93% of Taiwan's existing capacity is relatively within narrowbody range from Taiwan. This presents growth opportunity but also concerns to the legacy carriers who will undoubtedly see loss of passengers to LCCs, although LCCs will largely grow the market. In the medium-term, any new Taiwanese carrier would likely be restricted on services to Hong Kong and mainland China, which account for approximately 25% of international seats, due to existing tight controls, but opportunity can still be aplenty with regulatory reform. It has been on the back of the increasing LCC services into Taiwan by foreign carriers as well as LCCs opening in other North Asia regions including Hong Kong and Japan that the lack of a Taiwanese LCC has entered public discussion in 2012. EVA early this year indicated that it could convert its UNI Air subsidiary into a LCC. But EVA Air chairman James Jeng told CAPA in Jun-2012 that EVA was no longer considering converting UNI into an LCC, explaining that conditions in Taiwan still make the LCC concept challenging to pursue. The likelihood of UNI being converted into in an LCC has since further decreased following recent moves to further align UNI Air into EVA. Efforts to covert full-service carriers into LCCs elsewhere in the world have consistently produced negative results as taking costs out of an existing carrier prove too difficult. China Airlines president Huang-Hsiang Sun has taken the approach of watching the situation rather than instigating change – a typical but dangerous recipe for a legacy carrier that can result in responding under duress rather than when market conditions are favourable. The LCC mongering has largely come from TransAsia chairman Vincent Lin, whose frequent comments to the local press have kept the topic alive, even if some suggestions – having China Airlines, EVA and TransAsia unite to establish a LCC – were on the more creative side. Unlike Taiwan’s larger legacies, TransAsia only operates regionally within Asia, which gives it a different perspective. Mr Lin's more active role is showing early signs of progress, with Taiwan's Civil Aeronautics Administration in Sep-2012 issuing a formal statement on its policy approach to LCCs, reflecting their continued global rise is an "inevitable trend". While the policy was not an abrupt change by global standards, it did send the message to carriers that change will occur and it will initially support it. The policy made clear Taiwan's door is open to foreign LCCs while the regulator will respect "market mechanisms" if a local LCC is established. To further stimulate LCC traffic, the CAA also announced it commissioned a body to review airport charges, which currently do not have separate rates based on carrier type, and that it had considered the needs of LCCs in infrastructure planning and in due course would consider dedicated facilities for LCCs. Numerous details remain to be sorted, but the effect was an open door, both for a new carrier to enter the market but also participate in much-needed policy shaping. With the concept of Taiwanese LCCs being given a blessing, existing and potential carriers must now engage with the CAA in a game of chicken and egg to decide what will occur first: an LCC or reform. China Airlines and EVA have not been overwhelming in their support of LCCs. While Mr Sun of China Airlines said he would monitor the situation of LCCs, he also told the Wall Street Journal that "competition from low-cost carriers is a reality and you just have to live with it". China Airlines, EVA and TransAsia have rightfully pointed to hinderances to having a supportive LCC market in Taiwan: little liberalisation, flat airport charges and no LCC terminal. The CAA will review airport charges, and a LCC terminal is being discussed as a long-term outcome after the third terminal of Taipei Taoyuan is completed in 2018. But a dedicated LCC terminal is not necessary, and indeed certain Asian LCCs operate out of airports with some of the highest facility charges. Any dilemma over not having a LCC terminal underscores the crux of Taiwanese carriers' situation. They have placed themselves in a passive position, waiting for reform to be created before acting on new opportunities. LCCs, especially in new markets, must take an active role in spearheading change. Japan's three new LCCs – AirAsia Japan, Jetstar Japan and Peach Aviation – launched in 2012 without dedicated LCC terminals. But their establishment led to a response from airport operators; Osaka Kansai in Oct-2012 will open a dedicated facility for Peach while Tokyo Narita in Apr-2012 formally decided to proceed with a LCC terminal. Interim solutions were also found. To reduce airline costs, Kansai and Narita allowed bus-boarding - which had previously been practiced little. Elsewhere airports have been willing to work with airlines to use whatever space available to support passenger handling by low-cost airlines. It is improbable to seriously consider that Taiwanese airports will ignore LCC facilities until 2018. Indeed, Taiwan's smaller airports – like Kaohsiung or Taichung – may use liberalisation to lure start-up LCCs to their under-served airports. The CAA will need to abolish or clarify the existence of policies. One is that an enterprise that has engaged in international transportation or international trade business for more than five years and has over TWD10 billion (USD337 million) annual sales income may apply for international scheduled carrier service. An LCC would be pressed to achieve this target in its first few years. Bilateral or open skies agreements are less safe a reform to anticipate. Taiwan's two largest international markets by seats – mainland China and Hong Kong – are heavily regulated and any inroads LCCs could make with further policy expansion would be small as full-service carriers still jostle for capacity. But Taiwan's third largest market, Japan, is open skies following a 2011 agreement that has since seen considerable capacity expansion, in particular from China Airlines. Jetstar Asia and Scoot have both taken advantage of the liberal Taiwan-Japan market by exercising rights provided to Singapore-based carriers to link the two countries. 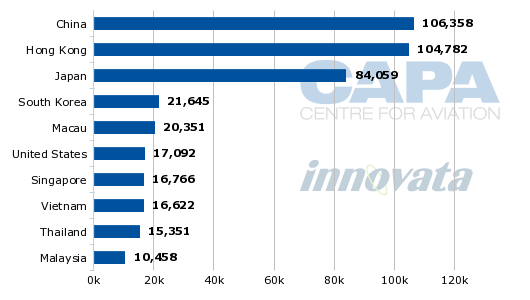 Of Taiwan's other seven top 10 markets, six are within narrowbody range (outstanding is the United States). Liberalisation is the theme of the region (Taiwan also has an open skies agreement with Singapore), especially on the back of ASEAN open skies from 2015. Taiwan is not currently a signer to the agreement, but Taiwan could pursue liberalisation – or at least expanded bilateral services – outside of that framework. Liberalisation simply must occur if Taiwan is to reach tourism goals. Japan has a similar relationship with using liberalisation to increase tourism, and the liberalisation there has been critical to a LCC market that became robust in mere months. Taiwan, like South Korea, is stagnating under restricted air services. Airlines can, and will need to, take an active role in pressuring the Taiwanese government to liberalise in order to support growth and the establishment of LCCs. With Taiwan still forming a more comprehensive outlook on air services, the industry must push for greater access. Change of course does not come overnight. While Japan's liberalisation, including of access to Tokyo Haneda, gave much of the nation cardiac arrest, further progression is needed. At CAPA's North Asian LCC and New Age Airline conference in Sep-2012, executives of Japanese LCCs gave examples of where further regulatory change is needed: runways and airport terminals are owned by separate companies, increasing bureaucracy and reducing opportunities for price negotiation; passengers cannot board a Japanese aircraft if it is re-fuelling and cannot also board and disembark from front and rear doors, reducing utilisation efficiency; and exceptionally qualified pilots often have to undergo recurrent training. Once liberalisation arrives, will Taiwanese carriers seize the opportunities? Liberalisation in Taiwan is inevitable and the sooner, and with airline backing, the better. Once it arrives, having airlines take advantage of the opportunities will require work. China Airlines and EVA are understandably inexperienced. They will also be distracted by other changes, namely their effort to reduce reliance on the volatile cargo market and the relatively recent and ever-expanding opportunity of direct services between Taiwan and mainland China. It is an important market, but so too are other Asian countries. With Taiwan wanting to increase tourists as well as sixth-freedom traffic, Taiwanese carriers need to consider a holistic network planning approach. The majority of the mainland market today may be making Taiwan its final destination, but with time it could be a stopover or merely a layover to another point. Statements from China Airlines and EVA that they are open to the concept of LCCs are at least a step in the right direction, but credence is diminished with comments that LCCs are competitors that incumbents "just have to live with", as Mr Sun of China Airlines said. TransAsia, the challenger to the China Airlines and EVA incumbents, is aware of the need for agility and how its position could quickly change with liberalisation. What direction to take remains to be determined. While TransAsia's Mr Lin has been pushing the LCC agenda, TransAsia may find that rather than establish a LCC – which it has not formally and clearly said it would – it could be better served as a hybrid carrier owing to its non-legacy status. Other strategy developments await finalisation. The placement of TransAsia's first widebody aircraft, forthcoming A330s, is undetermined. Intra-Asia is the logical market, but TransAsia has also stated that Australia, New Zealand and the Middle East is being considered. Even if it does launch one or two routes beyond Asia, TransAsia plans to maintain its Asian focus. "We will continue our growth as a regional carrier," Mr Lin said early this year. "Being a regional airline and expanding regionally only the last couple of years that’s where our growth power is and it also happens to be the right timing in that the region is experiencing tremendous growth." China Airlines and EVA may have historical experience in air transport but not realisation of change. TransAsia may be the opposite while pan-Asian LCCs on the hunt know how to move quickly, and can fly from day one with considerable scale and experience achieved. That makes a difficult case for a LCC subsidiary from an existing Taiwanese carrier, unless it partners with one of the pan-Asian brands. New carrier launches in Asia have primarily been subsidiary extensions, giving Taiwanese carriers another question to consider – now – about an eventual LCC: independence or joint-venture with another carrier. Taiwanese carriers taking anything but an active role in pressing for change will find themselves joining global peers in recovering and responding rather than creating bountiful new growth.